Born in 1945, Robert K. G. Temple holds an undergraduate degree in Oriental Studies and Sanskrit from the University of Pennsylvania. At the age of 22, he began writing his most famous work, The Sirius Mystery, published in 1976, which claimed that amphibious extraterrestrials from the Sirius star system were responsible for jump starting Sumerian culture. In the 1960s, Temple became friends with Charles Hapgood, the professor who believed that ancient maps indicated that an Atlantis-like civilization had charted the world in the last Ice Age. He also corresponded with the widow of Arthur Posnansky about that writer’s controversial (and false) re-dating of Tiwanaku in Bolivia to 15,000 BCE, a date Temple accepted. At the University of Pennsylvania, Temple he met Arthur Young, a New Age believer who explored archaeology and extrasensory perception and believed he had been in contact with extraterrestrials from Sirius who served as the creator gods of Egypt. Young made Temple the assistant secretary of Young’s Foundation for the Study of Consciousness in 1966. During the few months in which Temple held that position, Young introduced him to the anthropological work of Marcel Griaule, who had written of the Dogon tribe of Africa and their seemingly-impossible knowledge of the binary nature of the Sirius star system. This inspired Temple to write The Sirius Mystery after his move to England to explain the origin of the Dogon’s knowledge by tracing it to the Argonauts of Greek myth, whom he held to be real, and through them to the Egyptians and then the Sumerians, who had mistaken amphibious extraterrestrials from Sirius for gods. The Sirius Mystery received strong reviews because it seemed to rest on a bedrock of solid academic citations, though in time these would be revealed to be in three categories (a) outdated research superseded after Temple’s work was published, (b) inaccurate sources known in 1976 to be incorrect, and (c) secondhand sources that were misrepresented or otherwise incorrect. Temple went on to a career on the borderline between legitimate and fringe science, publishing serviceable mainstream works like The Genius of China and The Fables of Aesop alongside fringe works on hypnosis and extraterrestrials. 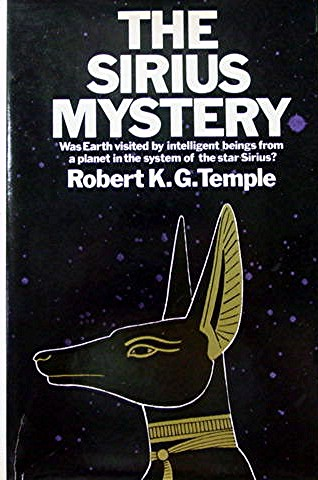 In 1998 Temple published a revised version of The Sirius Mystery at the suggestion of Robert Bauval, but his revision failed to address a major 1991 article by Walter van Beek, “The Dogon Restudied,” which concluded that the basis of the Sirius Mystery, Marcel Griaule’s research, was incorrect and the Dogon possessed no knowledge of Sirius. Therefore, there was no Sirius Mystery. That year Temple began to claim that a coalition of international security agencies, including the CIA, FBI, MI5, KGB, and NASA, had targeted him and worked to suppress his research into both extraterrestrials and hypnosis. He maintains these claims to the present day despite the fact that a careful review of all available U.S. government files turns up no references to Temple or his work in any form. By contrast, such writers as Erich von Däniken were discussed in the State Department and elsewhere.